The record-breaking weekend storm that pounded parts of Texas and Oklahoma with heavy rains and spawned widespread flooding has claimed upwards of 18 lives as of Wednesday, officials say. According to Reuters, the death toll from the floods now stands at 18, up from 10 only a day earlier. Authorities were still looking to locate 13 people who vanished during the storm, CNN reported. 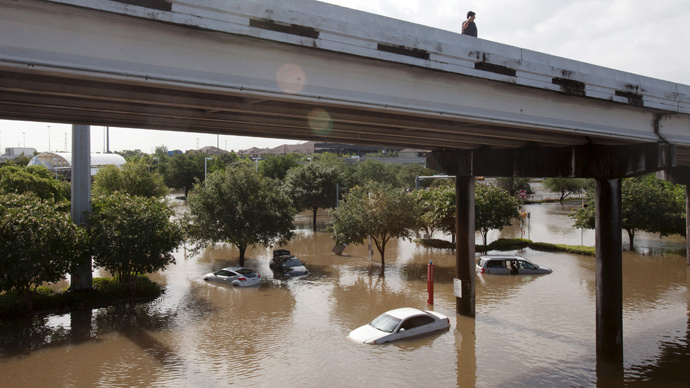 Five of this week’s fatalities occurred in Houston, Texas--the fourth most-populous city in the United States--where a new flash flood warning was announced by the National Weather Service on Wednesday, as nearly 2.2 million Texans are reeling from the weekend’s disaster. "This rain has the potential to cause additional street flooding so residents are advised to be careful as they commute to work," city officials in Houston announced on Wednesday. Earlier in the day, warnings were issued after a dam on Padera Lake in the town of Midlothian suffered from the heavy waters and authorities feared a breach was imminent. Hours later, Captain John Spann with the Midlothian Police Department told reporters that officials were “standing down” as concerns of further disaster started to subside. “We're just going to monitor and they're not expecting any time of catastrophic failure at this time,” Spann told a local Fox News affiliate. The toll of the Memorial Day weekend storm includes damages to around 1,400 structures in Houston, the city said. According to the Associated Press, around 700 homes in the greater Houston area have been damaged by the storm, and Reuters reported that more than 200 flights scheduled to either arrive or depart from airports in Dallas and Houston on Wednesday had been canceled.